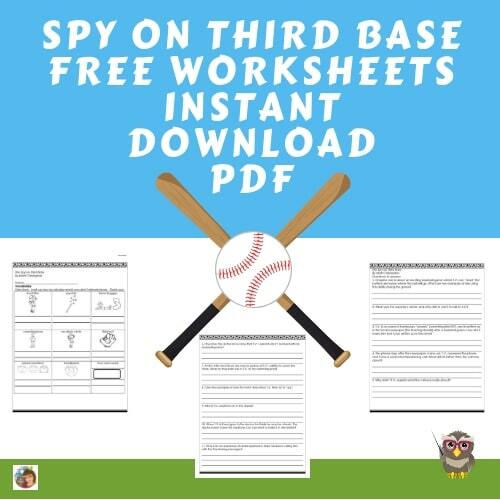 The Spy on Third Base byMatt Christopher is a baseball chapter book, and this post has a short review and a free printable. This is a baseball-themed book with a little mystery. T.V. Adams has a talent for predicting where the batters on the opposing team will hit the ball. When his teammates follow his advice, they are more likely to get the player out. But, they don’t always like following T.V.’s advice, even though a local newspaper prints a story about him. T.V. experiences some anxiety about how much to say to his team about plays. Some kids ignore or make fun of T.V., and he even gets a threatening phone call. Was he to blame when his team loses? 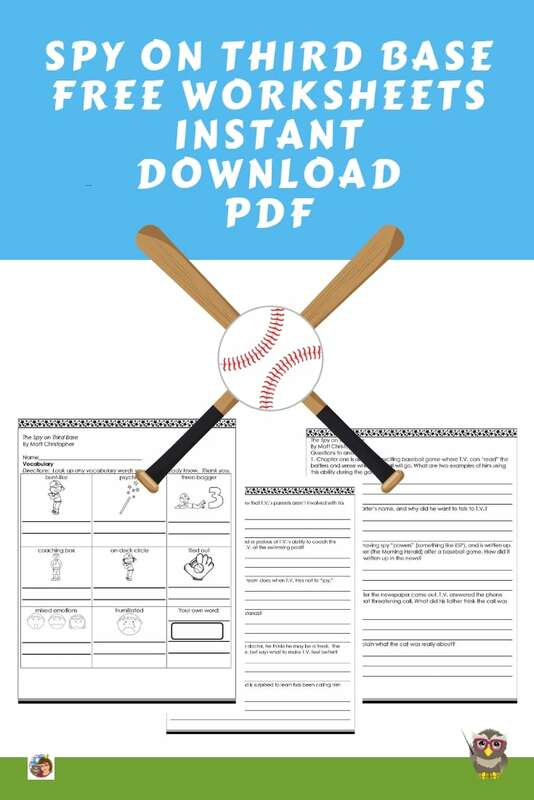 This is a great book for young boys who play team sports or like baseball. It seems sad to me that so many books for children are slanted toward girls, and this book is welcomed by boys as well as girls. This book is also a mystery to solve and there are many clues woven in through the baseball story. 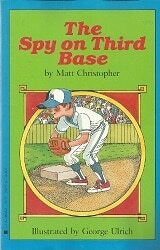 Is there really a spy on third base? Who notices the clues? Of course, the adults do not solve this mystery and it requires the thinking of the younger characters. Here is a link to the official Matt Christopher author page. He has written many great sports books for boys of different ages, so check out his list of books if you have a sports enthusiast at your house (or in your class). 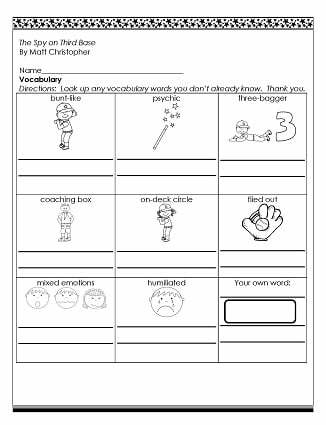 First is an illustrated word work page, perhaps for the literacy center or a small group. 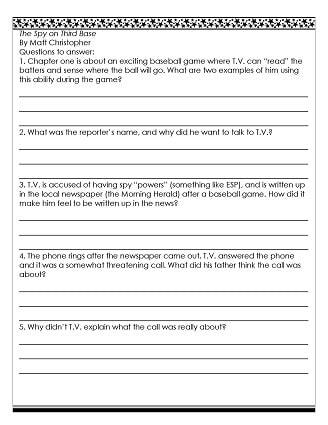 Next are a few pages of reading comprehension questions. These might be assigned for reading pairs or as independent work for early finishers. 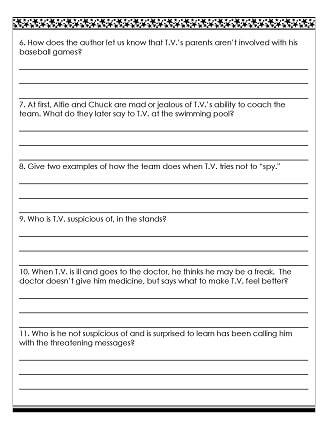 This is the second worksheet with reading comprehension questions. A full answer key is provided.